Marijuana is largely thought of as an agricultural industry serving medical and recreational consumers. But that image belies the technological advances that are revolutionizing every sector of cannabis. 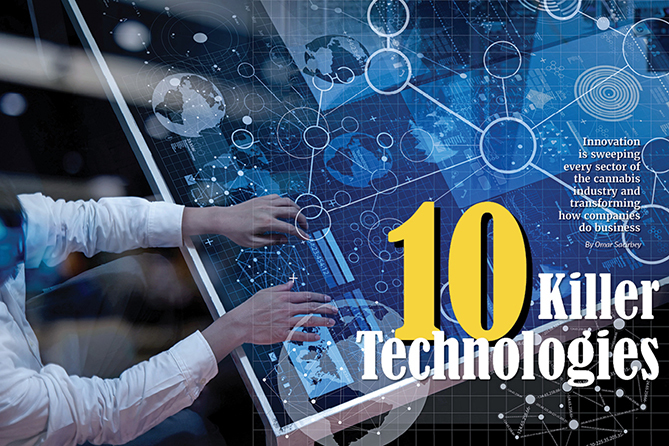 In this issue, we look at “10 Killer Technologies” in the marijuana space. Not the “10 Best Technologies,” but engineering feats that represent the spirit of innovation, high-level science and entrepreneurship sweeping through today’s marijuana industry. Many companies could have made this list. “Cannabis is still a new industry that’s just getting out of the shadows, so people see there’s huge potential to develop all sorts of new technologies,” said Meghan Larson, co-founder of Adistry, one of the companies featured here. Selections were made to represent the main marijuana market sectors—from cultivation and extraction to manufacturing and retail. Some of these companies are established and growing, while others are upstart ventures. Some of the technologies were created by cannabis industry veterans, while others come courtesy of non-cannabis businesses. Indeed, the marijuana industry is drawing a growing number of Ph.D.-carrying professionals who have worked at places such as NASA and MIT and now want to lend their expertise to an industry that, from scientific and technological standpoints, remains largely unexplored. The advances profiled in the following pages represent a sampling of the innovative technologies that are transforming the cannabis industry. Let It Glow Company UbiQD Where Los Alamos, New Mexico Founded 2014 Product UbiGro is a quantum-dot film that converts sunlight into the red-orange spectrum light that plants crave when flowering. The light also helps increase yield. Target Market Cultivators Price A company spokesman declined to quote a cost but said it is significantly cheaper than the roughly $100 per square foot that some greenhouses spend on under-canopy lighting. Cannabis growers often use expensive LED lights to bathe plants in the red-orange light spectrum that triggers flowering and boosts production. UbiQD has harnessed quantum dots—tiny particles of semiconductors like those used in computer chips and solar cells—to create UbiGro. The quantum dots are made into an inklike substance that is injected between two sheets of plastic film, which are then attached to the sides and roof of a greenhouse. The film does the same thing as lights but at a much lower cost and smaller environmental footprint, according to UbiQD chief scientist Damon Hebert. The red light also helps increase THC production by 5% and terpene production by 14%, Hebert said. Quantum dots have been used in other industries but not agriculture. Most quantum dots developed so far feature a cadmium base, which is sensitive to ultraviolet light and inclement weather and, thus, loses effectiveness. UbiQD’s breakthrough was developing copper-based quantum dots, which can withstand intense light and bad weather and be used in agriculture. The company has installed UbiGro for five vegetable growers in New Mexico and has a NASA contract to create film for growing crops in space. UbiQD has pilots in two cannabis greenhouses in Colorado and one in Oregon and plans more pilots this year. The cannabis pilots have seen 10% yield increases, Hebert said. Hebert declined to quote a cost but said UbiGro is significantly cheaper than the roughly $100 per square foot that some greenhouses spend on under-canopy lighting. “If we can realize a 5%-10% yield improvement, that’s a return on investment of three months to six months,” Hebert said. Hebert said UbiGro’s current plastic film will last five years, but he plans to develop a model using glass sheets that will last 20 years. The ultimate goal is to have the quantum dots installed in greenhouse glass or polyurethane, to make “a creme de la creme of greenhouse glass.” Read the full article here.